Plate thirty five from 'Picturesque Scenery in the Kingdom of Mysore' by James Hunter. 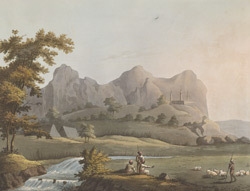 This aquatint is based on a picture by Hunter depicting hills north-east of Salem in Tamil Nadu. This area was know by the British as Baramahal, but this name is no longer used. A mosque can be seen cradled into the lower level of the hills.